Wind. A welcome breeze on a lovely summer day brings joy. At Pentecost in the Upper Room, a different kind of wind blew through the room along with the Holy Spirit. 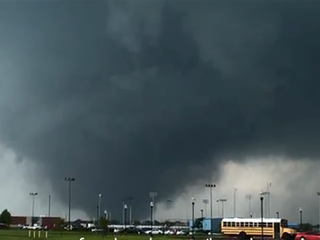 Ironically, the day following our observance of that Holy Spirit wind, the people of Moore, Oklahoma experienced a devastating version of the usual sort of wind as a tornado ripped apart that community. I grew up in the next town south from Moore. I no longer live in Norman but it and Moore are still part of “home” for me. So, the pictures of the aftermath of the tornado shocked and hurt as though I still live there. But in disasters such as this, people in general feel a kinship with the people affected. What if it had been our town, we collectively murmur under our breath along with a sigh of relief. What if, indeed. Like those stricken with any disaster, we would depend on the kindness of others who were not impacted. We would expect people from all over the country to reach out to help us, as well we should. I have a question, though. Why does it take something of this magnitude to touch people’s hearts and move them to action? It shouldn’t. In the parable of the sheep and goats in Matthew 25, Jesus tells us how he identifies those who love and serve him: “For I was hungry and you gave me something to eat, I was thirsty and you gave me something to drink, I was a stranger and you invited me in, I needed clothes and you clothed me, I was sick and you looked after me, I was in prison and you came to visit me.” Why would we so often do these things only in major disasters? For the person experiencing it, it takes much less than a 200 mile per hour tornado to qualify as a disaster. Loss of a job, death of a spouse, serious illness, to name a few, all these are disasters for those touched by them. So help those in Moore, Oklahoma, by all means. Then look around to see what you can do in your neighborhood for those whose lives need the blessing of the different kind of wind that only comes through the Holy Spirit. This entry was posted in Life and Faith and tagged blessing, disaster, Holy Spirit, Jesus, Moore OK, wind. Bookmark the permalink. mercy, and grace commanded by Jesus. I agree that it’s common for folks to blame the person involved for things like homelessness or job loss or even for mortgage woes. This was the prevailing thought of John Wesley’s day in the 1700’s. As founder of the Methodist movement, he battled that idea often. I think the important thing for us to keep in mind is that God asks us to help others as an act of obedience to him so if we would be obedient, we serve others, which doesn’t depend on whether they deserve it or we like to do it. After all, no one ever knows when the time will come when the help needed is for ourselves.